After sinking countless hours into Battlefield 2 and Battlefield 2142, I was disappointed to hear that Battlefield Bad Company (BC), released in June 2008, would not be making its way onto the PC any time soon. The new Frostbite engine supporting BC allowed for 92% of each map to be completely destroyed, offering an abundance of new tactical game play choices. Fast forward to March 2010 however, and Battlefield Bad Company 2 is thankfully upon us. Released across PC, PS3 and Xbox 360, the new Destruction 2.0 build of the Frostbite Engine has been extended significantly, with entire buildings now collapsible as opposed to just side walls. The inclusion of blood by default is also a first for the series, while one of the most important additions is the inclusion of bullet drop, where gravity causes shots from weapons fired over long distances to fall in height, adding an entirely new approach to ranged combat. The number of classes (or kits as they are referred) has been streamlined further from Bad Companies five, to four; Assault, Engineer, Recon and Medic are now available, with the Specialist and Demolition role condensed into that of the Engineers. A customizable weapon selection menu, similar to that in Battlefield 2 and 2142 allows players to select their load-out for the map before they spawn, while each class also has a pair of “gadgets”. 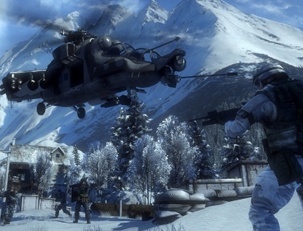 As with many of the previous Battlefield series, players earn experience while taking part in combat to earn weapons, and kit upgrades. Capturing objectives, killing other players, repairing vehicles or healing a comrade all go towards your kit total. A player can view all available weapons and enhancements for each kit from the main menu, and compare two weapons against one another while seeing how many points are needed until another unlock. Thankfully your kit totals are calculated in real time, meaning if you start a map several hundred points away from a new weapon or enhancement, and if you secure enough points mid-match, your weapon will drop on screen to alert you of its instant availability. The starting weapons for each kit are all well balanced and never feel underpowered against opponents of higher ranks, while the first new weapons that can be unlocked are only several thousand points away as you learn the ropes. It is odd however that the Medic must first unlock the medical pack and defibrillators before being able to heal and revive teammates, causing the class for the initial several thousand points to be nothing more than an armed soldier as your comrades complain as to why you didn’t heal them. You will however wrack up points quickly (in a single round I achieved 5490 points with the Engineer, topping the leader board and unlocking multiple weapons and enhancements at once) so the complaints remain short-lived. There are four multiplayer game modes within BC2; Rush, Conquest, Squad Deathmatch and Squad Rush. Rush involves players defending or destroying pairs of M-COM stations for as long as possible as the attacking teams tickets hold out. M-COM stations are destroyed by any player planting explosives on them (and can also be defused by any defending player) using conventional weapons or collapsing an entire building upon it. In Conquest players must capture and hold flags for as long as possible as the enemy respawn tickets hold out. Each kill makes the enemy lose one ticket, and enemy tickets continually decrease when a team controls more than half of the flags on the map. Squad Deathmatch (SD) is where four squads and one infantry fighting vehicle roam the map, with the team scoring fifty kills being the winner. Squad Rush (SR) simply places a squad of four players versus another squad of four players in a game of Rush. In two weeks, I have yet to encounter a single SD or SR server, but I suspect these are more prevalent in clan matches. The tiered nature of Rush however, where the attacking team forces the defending team back into new objectives is incredibly tense and makes for frantic, fast paced games. Many Rush maps are split into three or four stages; when the first area is lost, the second landmass will become available, followed in sequence to the third and fourth as the defending players retreat in order to regroup. It gives a great rolling feeling to the maps as the attacking force, while defending genuinely makes you feel like you are fighting the tide, but with a desire to just hold out long enough to win the match. A personal favorite of mine. To traverse many of the large maps, there are fifteen vehicles available in BC2, including the Black Hawk helicopter, quad bikes (wow they are fast) alongside player controlled UAV drones and light tanks. There does seem to be less emphasis on vehicle warfare in contrast to previous Battlefield games, but thankfully the Engineer still has a pivotal role against players holed up in buildings as well as vehicles when they do arrive on the scene. When a tank does appear however it feels far more threatening than in the past, and can swiftly turn the tide of battle if the opposition hasn’t prepared for it. My biggest bug bare with BC2 is sadly the lack of “going prone”. A player can longer lay down. At all. For those of you with experience playing Battlefield or Modern Warfare, this may come as a shock (I was moaning about it for hours during my first play sessions) however DICE have re-iterated many times that going prone will play no part in BC2 as it was so heavily exploited in the past, slowed down the game too much, and gave Snipers far too much of an advantage. It is odd at first not being able to go prone, but after several hours you will forget it was ever needed. I can’t help but feel however that if DICE had worked on counters to such prone problems, then the game would be better for it. 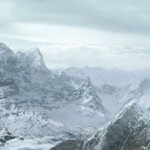 As for the destructive scenery from the Frostbite engine? Bloody brilliant. I’m afraid you will have to see it to fully appreciate the difference it makes when approaching the game, but I know it will be difficult to play anything similar without expecting it. And the single player campaign you ask? I haven’t a clue. I made it to the opening cut scene before jumping back into multiplayer. 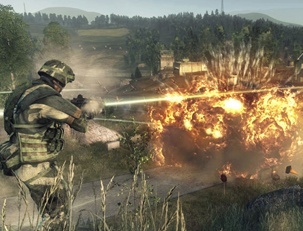 BC2 may not be revolutionary, but the level of polish, tweaks to bullet drop, kit refinements and unlocks, destructible scenery and vehicle changes adds such a sparkle to the game that Modern Warfare 2 should hang its head in shame. I agree though, Bad Company 2 is excellent, and I’m having a blast with it on the PS3. The larger maps and more tactical flow to combat are a god send having recently been playing the more frantic, boxed in Modern Warfare 2, and there’s a genuine feel of war about each battle that makes it so much more than just running around hunting for kills. I find myself playing it because I’m enjoying being part of a squad based, tactical battle and not just to improve my K/D ratio or to level up. Like you’ve I’m also yet to properly start the single player game. For me that is VERY strange.. probably the biggest compliment to Bad Company 2 I can personally give infact! Sorry Lew I’ll get to your article as soon as I’ve read it, but Mat, have they fixed the mic and squad issues with the PS3 version because 1943 was totally borked and pretty much unplayable as a communicative co-operative game. The mics just plain didn’t work and the squads frequently got separated. I never played 1943 beyond the Xbox 360 demo, so I’m not too familiar with the issues there, but I can’t say I’ve encountered too many issues with Bad Company 2 on PS3. Although I don’t own a mic myself (need to correct that sharpish) I haven’t noticed any problems with others, and certainly not with squads. There were some pretty big server issues to start with but these seem to have been ironed out now. As with 1943, DICE apparently underestimated how many people would be playing!